Townhouse in Millwoods - 1.5 Bath! Huge Deck! Close to major shopping amenities, schools including J Percy Page High School and Meyonohk Elementary, Millwoods Recreation Centre, Grey Nuns Hospital, and the large Millwoods bus hub. And with easy access to 23 Avenue and 91 Street, accessing Anthony Henday or Whitemud Drive is a breeze making any commute whether by transit or car a dream come true! This very clean and well maintained unit in Pinetree Village is private, yet accessible. Outside you'll love the south facing large front deck, helping you enjoy those warm summer evenings! Inside the unit you'll find large living room that leads onto the deck, which means large glass doors that fill the unit with natural light. The living room leads into the spacious kitchen and dining area. You'll love the kitchen with its large amount of cupboard and counter space as well as the large fridge and dishwasher!! There is also a half bath on the main floor! Upstairs is home to the 3 bedrooms, which includes a spacious master bedroom and a full bath. The unfinished basement is home to the furnace and hot water tank as well as the washer and dryer! This space, with a small unsecured carpet patch would make for a perfect storage area, or with a little work a great playroom or office! 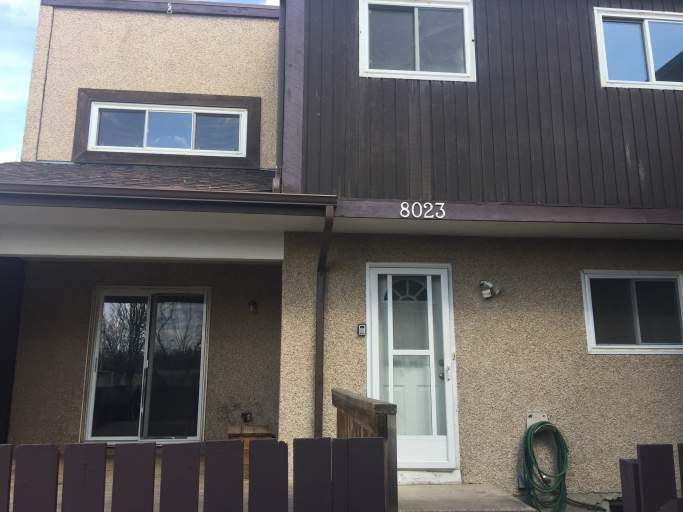 3 Bedroom Townhouse Availability - Townhouse in Millwoods - 1.5 Bath! Huge Deck!